Följ min blogg med Bloglovin - Look at Maria, she is so good at eating! That was my what my mum used to say to chear my small brother up, when he refused to eat. He hated to eat regular food and just wanted the desserts...and he got it. After some nagging, he got his dessert. Nobody had to threat me to eat. I ate as it was the last meal in my life, ever. EVERYTHING I could stuff in my mouth, but off course, there was favourites: Cookies! 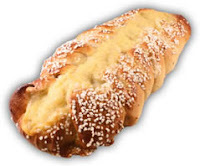 At that time, a coffee break was not just a break with coffee, there was always some kind of snack - cookies, buns, sandwiches or a dessert, and it was a natural part of life - we have a special word for it - fika. My grandmothers and my mother baked a lot. We also had a neighbour who baked the most delicious cookies and when you got invited for coffee time, there was at least three plates of different kinds of cookies and buns at the table. I had to learn that, you just took one of each kind. If I would have been allowed, I would have cleaned the cookie plates. I don't remember when I started to steal cookies from my mums freezer and pantry but it started early. I got punished both physically and emotionally, when my mum wanted to serve cookies for parties or special occasions and found the cookie jars almost empty. I always tried to just steal one cookie but I could never stop...one cookie was never enough. I was about four years old when I discovered that I could take a spoon and dip it in sugar and eat it, or mix cream with sugar...Oh, it was so TASTY! It felt like a big hole inside of me wich I tried to fill up with sugar and fat and now a days, when I am an adult I realise that I grew up to be a sugar addict before I could even remember it. I grew up with gruel, porridge with sugar, tea with sugar, bread and cookies - when are you able to say to your self that you are addicted to sugar? I am convinsed that my mum (and the rest of the family) is addicted to sugar also. I know that my mum starts her day with coffee and cookies in the bed! Afterwards comes the breakfast. Today we don't bake as much as before but the amount of cookies is constant. 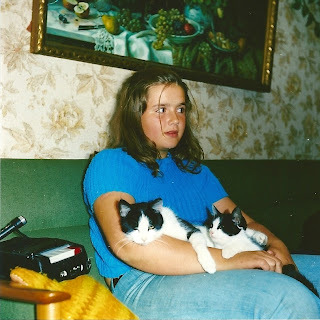 I started to hear about how fat I was ...and somewhere in the early age, starting school did that comment about me being so good at eating switch to: - Don't eat so much, Maria, you are/will be so fat! 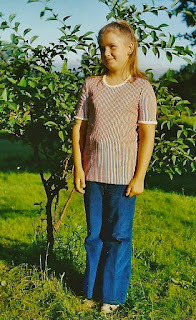 This photo is taken of me, the day I started second grade (8 years old). 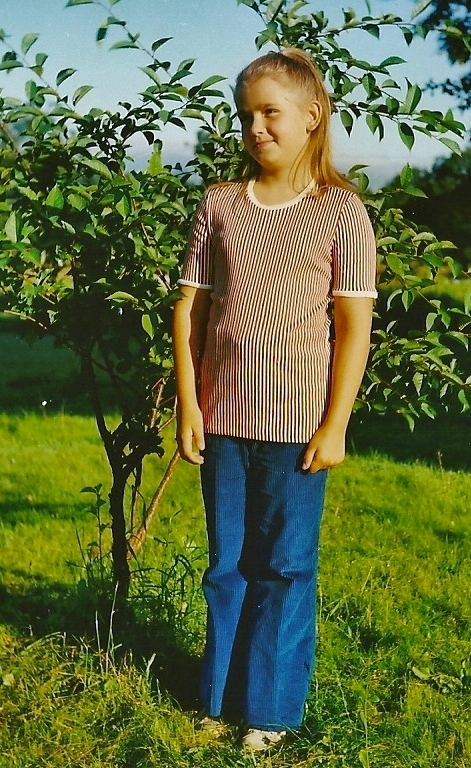 I remember it so well, standning in our garden with my hair in a small ponytail, blue manchester trousers and a striped t-shirt (the stripes vertcal). When I look at the photo today, I just see a regular, normal weight kid at eight years old. But I remember the feeling of how fat I was. I remember that all my weekly allowence (In Sweden it is costum to give the kids a small amount of money every week, to learn how to use money) went to buying candy and I also started to steal money from my parents to be able to finance my sugar crawings. If I couldn't find any money, I tried to cheat our small food store by telling them that my mum sent me to buy things and the owner could write a bill for my parents. At that time you could buy food and pay later. I remember the feeling of despair and humiliation when the owner actually didn't belive me and refused to give me what I wanted. Oh, what would I eat THEN??? Lucky for me there was always cookies in the freezer... and sometimes icecream. I even stole from my brother, both coins and his hidden candy. He could save for months while my candy was finnished in minutes. I got spanked by my mum when she discovered my stealing raids but nothing could stop me - nothing! The crawing couldn't be stopped, no matter how painfull the spanking was. When I was eleven, I applied to start to swim. I thought that if I exercise a lot, I might loose some weight. We trained swimming five days a week and when I was "at the top", I was swimming between 5000 - 7000 meters each time. But I didn't loose any weight! It was horrible to stand on the starting platform at races, beside the gilrs I was compeeting aginst - small, slim girls, years younger than me but faster than I was. I was very strong, and fit...but heavy. That was the reason I could never be a fast swimmer. I could swim thousands of meters but I never fast, just very strong. In school I got constantly comments about my weight from school nurses, teachers and the staff in our school restaurant, that I should exercise more and eat less...how in earth would I get more time to exercise more? I already trained as an athlete, walked to the school bus, took the bike every where, living in the forest, far away from everything etc. It was just simply hard! My first attmempt to diet was when I went to a confirmation camp. (When you as a christian confirm the babtism) I tried to eat less sugar, bread and smaller portions of food. I did what I always heard - ate less. I don't know how many kilos I lost but enough to make me put a saftey pin in my skirt at the confimration day, two weeks later. I was so proud of my self and was thinking that I would never go back to my bad habbits when I came back home. I think I just got home and forgot that thougt in a second. One day, when I was around 14 years old, me and my mum was at the hospital. I don't remember why but I met a girl in the same age as me there. She had dark hair, a sweet face and was fat, just like me. She told me that she was in the hospital to loose weight. I thought that was a brilliant idea and succeeded to convince my mum and some doctor that I should do the same. The situation in school didn't get better either. Above the school lunch, there was sandwiches, cookies, candy and softdrinks to buy and my complete fixation to this type of food, made me NEVER to miss any occation to buy a sandwich, a cookie or a soft drink in the afternoon. The steeling of money continued and the punishments came with it. When my parents realised that I had stolen most of the money my mum got from selling six Labrador puppies, the punishment was no weekly allowence for six months. But I always managed to get cookies or money in some way. I was always in debt to my friends, borrowing cigarettes or money. The bullying was also constant. There is no limit of verbal abuse, you can say to a overweight teenage girl! They even bullied me for my big, brown eyes! But that didn't have the same effect as being bullied for my weight and size. The self asteem was very low if there was any at all. 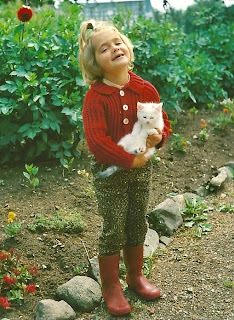 I was fat, stupid and lazy - completly out of character. If I went to the school nurse to get a head ache pill, she talked about my weight etc..and I refused to step on the scale, I refused to talk about my weight - I just got angry and obstinate. I finnished school and moved out from home the same week. My mum had found me a nanny job, a copple of miles away and before I knew it, I didn't live at home anymore. The same year, my parents divorced and my siblings got shared between my parents. My sisters with mum and my brother with dad..and Maria? 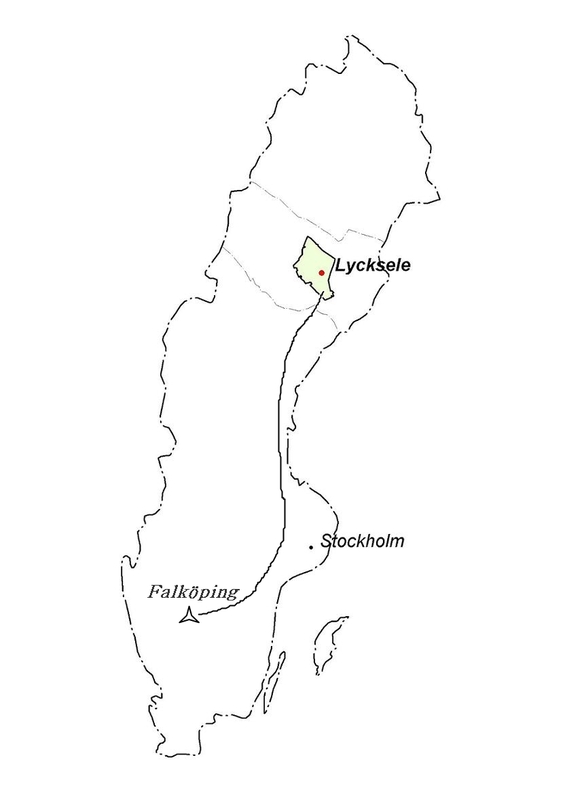 Well, I ended up in another part of Sweden, far away from where I grew up, in a house as a foster care child. Me and my parents agreed that I didn't want to live with any of them and I had met a guy in the foster family that I had fallen in love with - so placing me in the same family was "perfect" for everyone involved. The guy was 23 years old, an alcoholic and a drug addict, something no one reflected over. He was free from the drugs and alcohol in the foster family...well, after a copple of months he started again and he left the family. I stayed. My foster mum was also big and I learned about the Weightwatchers. We tried to go on diets all the time and the best part was, even if we didn't succed to loose any weight - I wasn't alone with my weight problems. I wasn't alone to fail. Me and my foster mum was on a diet one week and ate cookies and "bad stuff" the second week. We call it yo-you-dieting - You loose some weight and gain it again, plus some more. 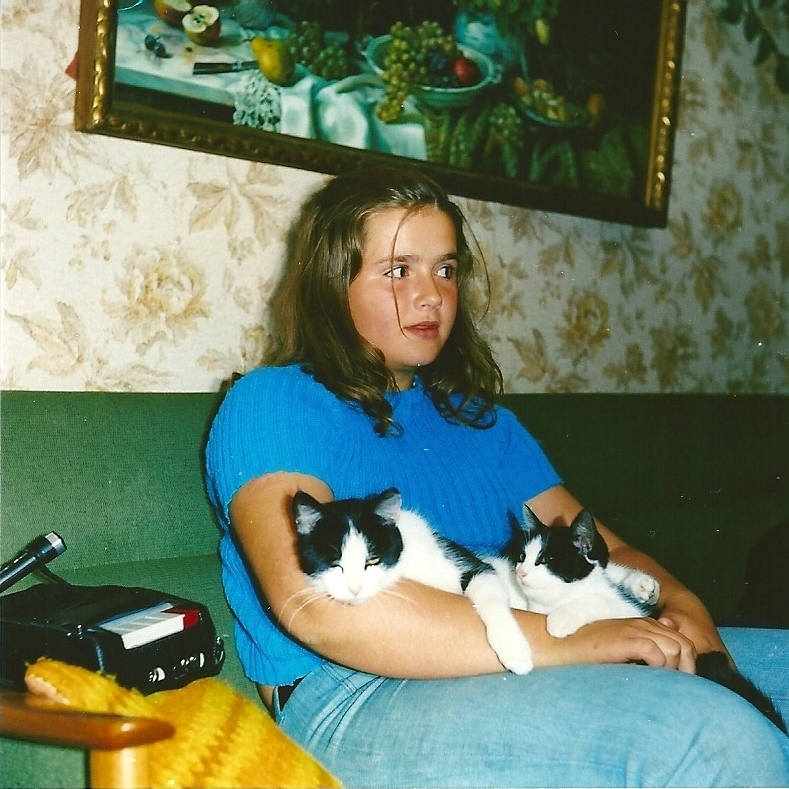 I stayed in this foster family for a year, until the family splitted and my foster mum and her husband, adoptive son and another foster child moved to antohter part of Sweden and I became homeless. I returned to the part of Sweden I had my best friend and got my first apartment. I just missed one thing - to have an income and provide for my self! - But sweet child, you are not an adult. Who is your legal guardian? Some one actually got a responsibility to take care of you! Oh? Well, who was that person? My mother or my foster mother? The social service found out that my foster mum was my temporary guardian and my mother for the rest of it. 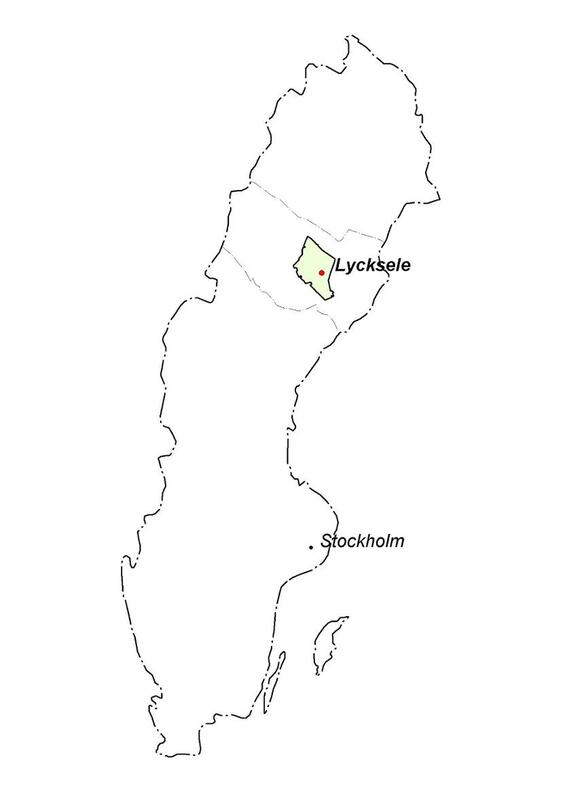 My mum had met a man and moved with my sisters far up in the north of Sweden, to a city, called Lycksele. My dad had resigned to be my dad because he was not my biological father...well, that is another story. The social service in Falköping (the town I lived in at the moment) contacted my foster mum and my mum and suddenly I got a better apartment wich my mum payed the rent for, by the allowence she got for being a single mum - and the best of all - I had a fridge and a freezer stuffed with food! I got signed in to a secondary school and got a study loan to provide for my needs. At that time we got the whole loan in one time, wich I was supposed to use for the whole semester. I failed completly and the money was gone in a month. I bought food for all of it! When I was really poor, I lived on instant pasta and buttter. I never liked ketchup so much. My economy was a total disaster and an my studies too. I wasn't bullied in school but I noticed all the whisperings and saw the pointed fingers...I just had enough of that same old feeling from my primary school. I got to sensitive to this type of behavior. I stopped school and had depts above my head. I found a job in a kiosk ( a small booth where they sell candy, magazines and tobacco) for a copple of months, so I could provide for my self. At my work there was something I loved most of everything: Candy - and I didn't have to pay for it! HA HA! After a copple of months I broke down completly when the job finnished and I couldn't provide for my self. I called my mum and cried and she wanted me to come up to Lyckslele, so she could "take care of me". 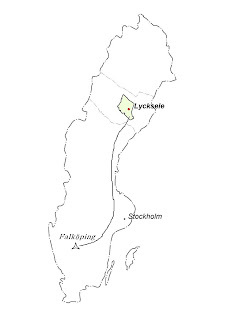 How do you get from the south of Sweden to the north, with out money? Now the second fase of my life started - the life in Lycksele. I was 18 years old, that summer. I love your story so far, thanks for being so honest and sharing it with us all.